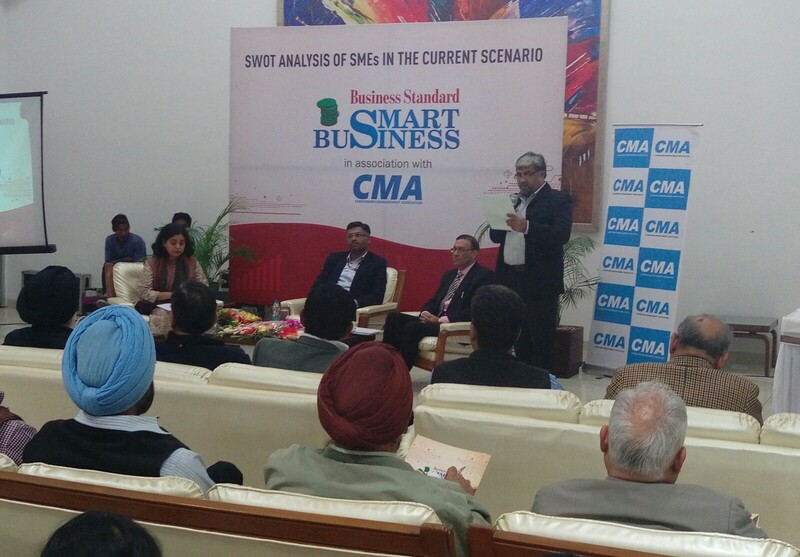 CMA organized a smart business event in collaboration with Business Standard – titled “SWOT Analysis of SME Sector in the Current Scenario” on November 25, 2017 at the U T Guest House, Chandigarh. 70 CMA members attended the event which was followed by High Tea. The panelists were Er. Nalin Tayal, Managing Director, GATS India Ltd. and Dr. J S Saini, Prof. & Head, Entrepreneurship Development and Industrial Coordination Deptt., NITTTR, Chandigarh. The session was moderated by Ms. Jyoti Mukul, Associate Editor, Business Standard. Smart Business is an event series where Business Standard works with trade/manufacturing/industrial associations and industry bodies at a local level and help highlight specific issues that are of concern to businesses, specially the SME. Acting as a neutral platform, it helps multiple voices to be heard including those of government, industry representatives and academicians. Our topic covered the strengths, weaknesses, opportunities and threats that are being faced by the SME specially post demonetisation and GST.